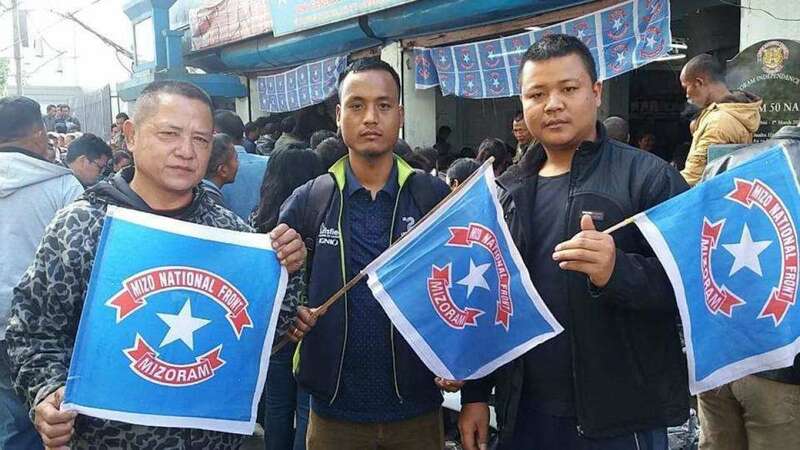 Aizawl : Securing an absolute majority in the 40-member Mizoram Assembly, the MNF on Tuesday returned to power after a decade, crushing the Congress and ousting it from power in the last Northeastern state it ruled. The Mizo National Front (MNF), which got only five seats in the 2013 Assembly polls, secured 21 seats and was leading in five more while the ruling Congress won only five seats. The Congress had taken power in the state in both 2008 and 2013 elections. It won 34 seats in the last election. The Bharatiya Janata Party (BJP) made its entry into the Mizoram Assembly winning the Tuichawng seat. Chief Minister Lal Thanhawla lost both the constituencies (Champhai South and Serchhip) he contested -- to MNF's T.J. Lalnuntluanga and Zoram People's Movement (ZPM) President Lalduhoma respectively. MNF supremo and Chief Ministerial candidate Zoramthanga was elected for a fifth term from Aizawl East-I, defeating Independent candidate K. Sapdanga. Buddha Dhan Chakma, a Minister in the Congress government, who just before the November 28 polls joined the BJP, won in Chakma tribal-dominated Tuichawng constituency defeating his MNF rival by 1,594 votes. Five independents won and three others were leading. Former IPS officer and security in-charge of former Prime Minister Indira Gandhi and Zoram People's Movement (ZPM) chief Lalduhoma defeated outgoing Chief Minister Thanhawla in Serchhip by 410 votes. Lalduhoma quit the Congress two years ago before forming the ZPM. Popular Aizawl Football Club (Aizawl FC) owner Robert Romawia Royte, who contested on MNF ticket from Aizawl East-II, also won. The BJP had undertaken intense efforts to oust the Congress in Mizoram after forming governments on its own or in alliance in the others in the Northeast. The MNF, a constituent of the BJP-led North East Democratic Alliance (NEDA), ruled Mizoram for 10 years -- 1998-2003 and 2003-2008. However, both the BJP and MNF fielded candidates separately in 40 and 39 seats respectively this time.